One of the most powerful tools you can have in your mixing arsenal is a Parametric EQ. Understanding the proper way to use an EQ will yield you warmth, space, glue, clarity, and an overall pleasant musical experience that we all want to create. Using a Parametric EQ to it’s full potential is what separates the men form the boys, the pros form the amateurs. In the next few weeks I will be diving more in depth into this topic, but today I want you to understand the controls of a Parametric EQ and what they mean so you can be on your way to using any EQ like a boss! It’s just a volume fader! 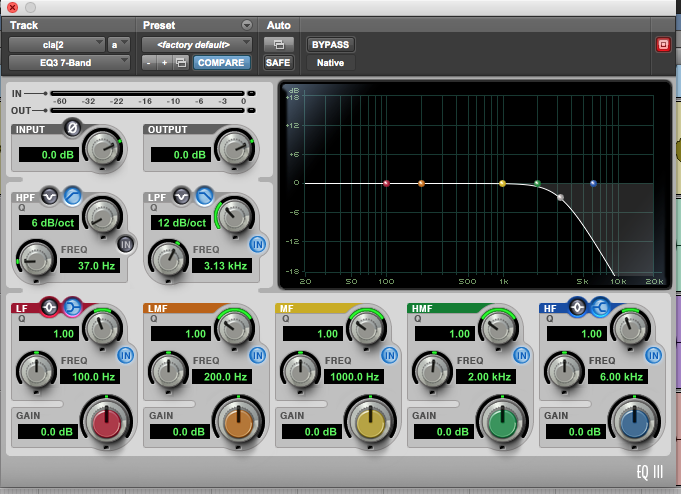 An EQ is just a really smart volume fader. It’s really that simple. If you dive in, an EQ really just turns up or down the volume, not of the whole track, but of a specific frequency you’ve selected. It’s like a surgical volume fader. A regular volume fader will allow you to turn up or down a whole track to achieve a balance with the other tracks. By the way, BALANCE is the key! Spend some time with just your volume faders and pan knobs BEFORE you add EQ or compression. Once you have that initial balance, you can then use a parametric eq to get rid of unwanted frequencies that may be adding mud and harshness to your mix. Not every track needs to occupy all the same frequencies. So this is why an eq is so important. 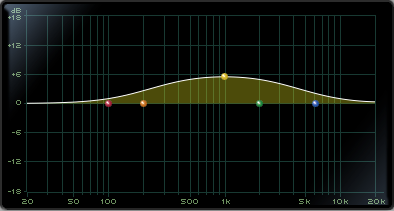 You can literally carve out an eq spot thats just right, on a track by track basis. Soon we will be calling your Doctor cause you’ll be so surgical! I know there are only 3 in this pic, but I’ll get to the 4th one in a bit. Once you understand each control, then you will be able to control every EQ band, Low, Low mid, High Mid, High. 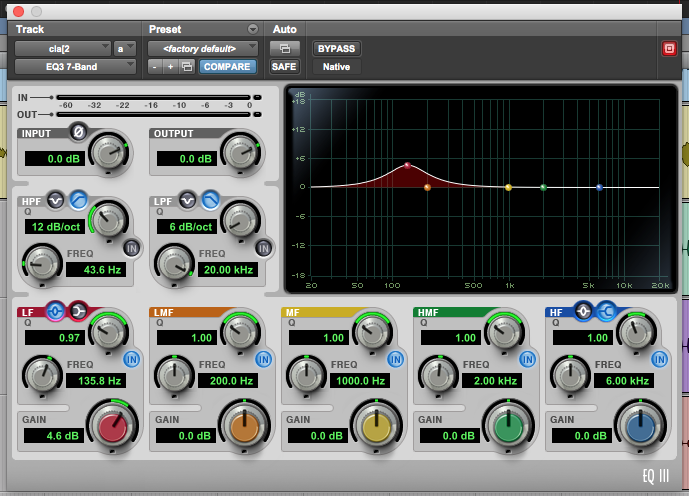 So don’t be intimidated if you see a 7 band EQ. You got this! If you need a little more air on the vocals, maybe point to some super high frequencies and boost a little. If you need to cut out some Low mid range mud, then point it to around 200-400 hz and pull a little out there. Just pointing to the freq does not effect the audio, it just puts you in the right spot so you can begin to operate. Catch my drift Doc? Once you have pointed at the right frequency then you need to decide if you want to boost (turn up) or cut (turn down). I typically like subtractive EQ, turning problematic frequencies down in order to expose the wanted frequencies, which typically makes for a warmer, less harsh result. Again, over the next few weeks I will be diving more in depth on each setting, and also shooting a video series all around EQ. I have to hit the basics first, so bare with me my peeps! The Q selects how wide or narrow of a range you want to effect. Sometimes if there is a weird ring in a snare drum, I’ll boost a super narrow Q, and sweep around with my freq knob until I find the ring and then cut that freq out. 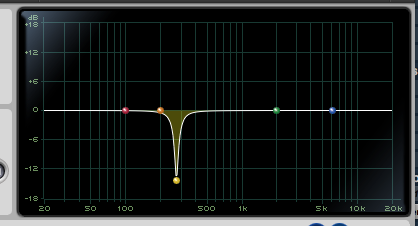 So I boost to find it, then get rid of it with subtractive eq. When cutting out freq you don’t want, you can get away with a narrower Q. It’s when you’re boosting freq that a narrow Q can get really harsh. 4. What type of EQ shape? Now you need to decide what type (shape) of Eq you want. 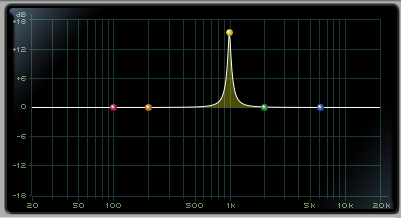 Be default, and what you probably picture in your head when you think of a parametric eq shape, is a bell or a notch. 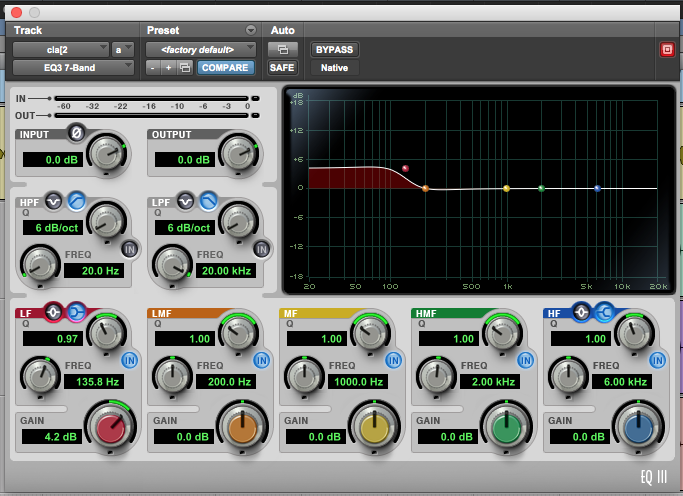 On the Low and High ends of your EQ, you should have the option to switch between a bell/notch, or a shelf. You can boost or cut these shelves just like any other control. Usually when I want that air I talked about on the vocal, I go for a high shelf boost around 10-16khz and maybe a little higher. Just a few Dbs. We also have what they call a High Pass, and Low Pass filter. I will ALWAYS use a high pass filter on pretty much every track in my session. Cutting out everything below 100hz or so on the low end of every instrument (track) besides Kick and Bass, will allow the low end to sit right and help your tracks sound less muddy. The only instruments that need to occupy around 100 hz and below are your low end instruments like Kick, Bass, 808s, low synths etc etc. Decide what tracks will be your low end and cut out that information with a high pass filter on the rest of the tracks. Now that you have a better understanding of what all the controls do on a parametric eq, I want you to keep it simple. Just because we can go to the extremes with this tool, doesn’t mean we need to. It’s usually the subtle moves that make the biggest difference. I believe the proper understanding and use of EQ is the MOST powerful tool in your recording and mixing tips arsenal. The main goal in a mix is to make everything balanced. So after setting up proper gain staging, and getting the initial balance of just volume faders, and pan knobs, which some call a “static mix”, EQ is the 1st plugin I use to start sculpting away unwanted frequencies, or painting in some color. I know some of you may role your eyes when I talk about mixing as an artform, but it is! It’s an extension of the artist who wrote, and performed this material on recording day. Just like how recording is an artform. It all ties together. That’s why when EQing I view myself as a sculptor and a painter. Below is a video breaking down the controls we talked about above. You’re either chipping away unwanted frequencies to reveal and highlight the good frequencies, or you’re boosting and adding “color” to tracks to enhance the sound that is already there. Mixing tips can be found in abundance all over the internet, but I hate to break it to you, not one of those tips will individually make your mix sound awesome. It’s a 1000 little moves that make a mix great. 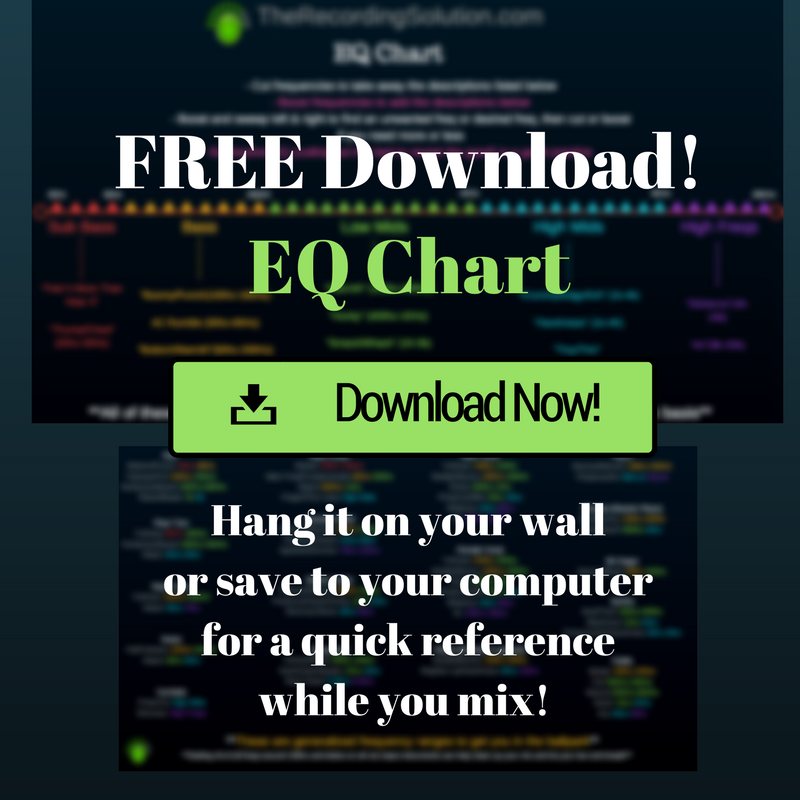 If you can understand EQ then you have a head start on reaching that end goal of a great mix. I’m not saying all these mixing tips are not helpful, hell I have plenty on my site and Youtube. I’m just saying to really dig deep and take a big bite out of understanding EQ. It’s really not that hard. Lets dive into the different approaches to using EQ. What it does is cut or subtract the unwanted frequencies that are covering up the true essence of what the track can sound like. It’s like a dirty film on top of your audio. You need to remove that film to reveal the HD quality of sound. That’s the way I like to look at it. Your goal here is to sweep around and find some nasty sounding frequencies, then cut them out. Subtract them from the equation, Say bye bye. Say adios amigo……Ok I’ll stop. Check out the video below to see and hear this in action, and with more explanation. Additive EQ, or boosting, is sometimes frowned upon by audio engineers. They argue that you can paint yourself into a bad corner with unnatural results, and eat up very precious headroom. Using this method can yield these negative results if done incorrectly, but if used correctly, can add energy, excitement, snap and grit! Additive Eq can get certain elements of a song to pop out just right in a dense mix. Below is a video covering this a little more in depth. This EQing nugget will help you widen up your mix without having to use a stereo widening plugin. This will sound more natural and musical than a stereo widening plugin that could cause some weird phasing issues. Check out the video below and learn just how simple but effective, COMPLEMENTARY EQ moves can be. Mix buss processing can be a little scary at 1st. You can easily ruin a good mix fast. You can also enhance a good mix fast with a bunch of different processing. I like to use some analogue emulating plugins from Slate Digital to make it sound like it was run through the circuits of a $100k board and an awesome tape machine. 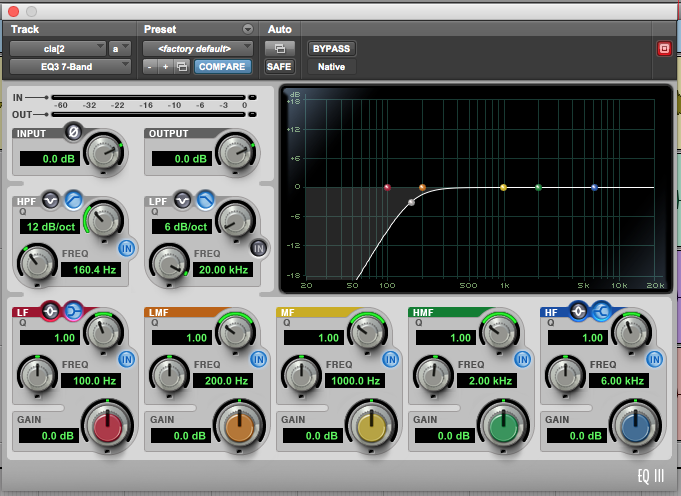 My favorite mix buss move is EQ though. Using EQ on the mix buss ( your master fader where all the individual tracks dump into) can be a nice way to shape the whole mix at one time. I like to think of eq on the individual tracks as fine calculated paintbrush strokes, and on the mix buss as long broad smooth brush strokes. By doing eq moves on the mix buss you’re kind of acting as a mastering engineer using very small cuts or boosts to enhance the stereo mix as a whole. It’s pretty cool when you think about the power you have there! Just be very careful you don’t “paint” yourself into a corner. Things can get shaky real fast. 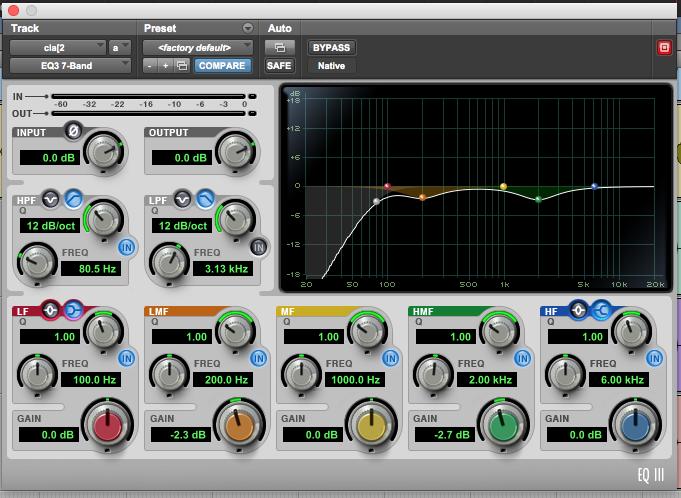 Check out how 4 small eq moves on my mix buss enhanced an already good sounding mix. Check Out These posts On EQ Also! How to get your kick and bass EQ rockin’! What is audio compression and how the hell do you use it? !